We’ve had quite a few customers come forward and ask if it would be possible to connect several domains with Divvit under the same account. They said it would be useful to be able to compare several of their stores, and we agreed. Our own Divvit Wizards (our Developers) have been hard at work over the past week or so rolling out a new feature for our customers. Introducing the new Aggregated Account view, where you can track and compare several domains on the same account. To add more accounts to your Divvit account, you go through the exact same steps as you did when you first connected your site to Divvit. If you click on the blue Add Site button on the top right, you’ll be brought through the same integration wizard that you used with your first account. Once your account is connected, you can see all of your connected domains with their unique frontend Divvit ID in blue. This is the number that you’ll put into the code of your site (see our integrations section for a walkthrough on how to connect your site to Divvit). From here, you simply click the Aggregated View in the drop down menu to access your composite view. And voilà, you have your multiple domain account ready! Another great feature is that you can now select for which domains you want an aggregated view. For example, say you have 5 sites, but you want to look at cross-site analytics for only 3 of them, you can drop down, and click "Select Multiple Accounts". Then select each site that you want to include, and then click Aggregated Account to view them. With this, you can exclude newer domains when you're looking at your metrics to make sure your results aren't skewed. If you have several regions, you can focus on localized sites per region. 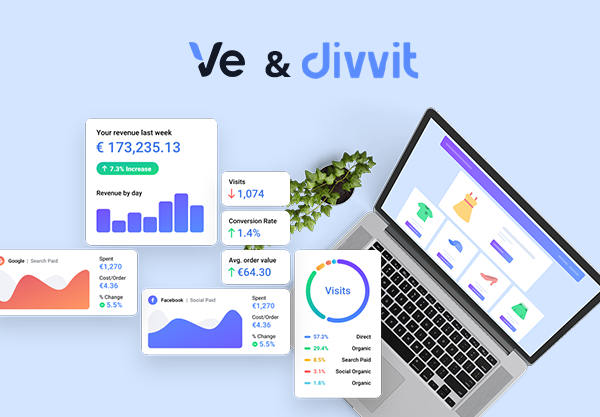 Now with Divvit’s Aggregated account view, you can see all of your most important metrics for all of your domains on one dashboard. Here, you can look at the overall trends of your traffic, order count, cost, and order value for all of your different domains combined. From this page, you can change the time frame you’d like to look at and see where your metrics are projected over the next time period. Looking into your traffic across each of your domains is useful for noticing overall trends across different markets. In the above example, we can see that most channels are doing better than the previous month with the exception of paid Facebook traffic. We know that either Facebook campaigns were stopped, or something serious is happening with the ads. They’re not bringing in nearly as much traffic, with a 16% loss. With the aggregated account view, you can check out which of your campaigns are paying off. In this example, email traffic is doing particularly well, boosting 23.1% more traffic than in September. Understanding where your total traffic is coming from can help you spot problems and opportunities for growth. If this looks a bit like your traffic view- that’s a good thing. That means that your most profitable channels for traffic are giving you the best ROI. However, we can see above that though email campaigns were bringing in much more traffic than the previous month, overall conversions were down by 3.3%. You now know that your email campaigns are getting great click-through rates, but something is amiss when the customer lands on your site. You can try to create a better landing page, or bring the customer to a product line in particular. Another bit we can notice is that though organic Facebook wasn’t bringing in much more traffic (only 5.5% more), it had a huge effect on conversion, which was boosted by 44.5% from the previous month. You can see that your organic Facebook channel is successful when it comes to bringing in customers that will buy. On the upper left side, you can choose to look at your channels by order value as well. Looking at the order value can give you insight into which channels are bringing in the customers that spend the most. Here, we get key information on how much the customers from these channels are spending, and it appears that while organic Google traffic was bringing in only 59.2% more orders (and only 15.1% more overall traffic in October), this channel brought in 67% more in order value. What conclusion should we make based on this data? If organic is bringing in less traffic, but more orders of higher value, an SEO strategy built to last is the way to boost Google’s traffic, and thus, the conversion rate. In addition to understanding your traffic and orders on an intimate level, you can also check out how much you’re spending per channel. In the costs section, you can analyze how much you’re spending per visit across each of your domains combined, and the cost you spend per order. You can use the Aggregated Account view in your Analytics Explorer to do everything you were able to do with just one account. With the Analytics Explorer in Aggregated View, you can compare each of your sites and their individual orders. You can also see what their order value was based on each incoming channel per site. This way you can make sure each of your sites are up to par on mobile optimization. 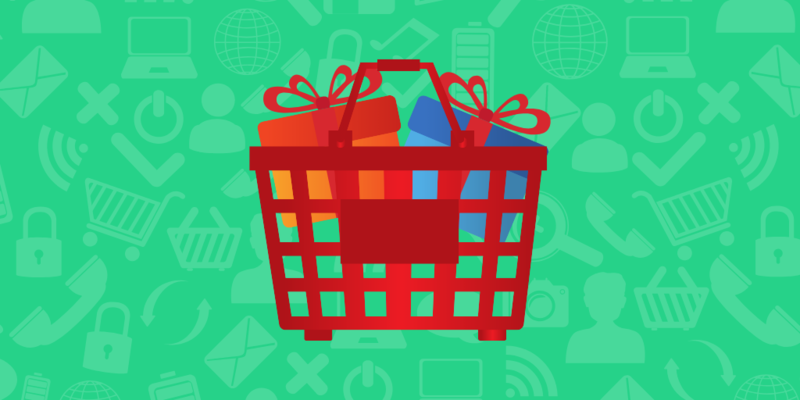 If you see one store in particular that isn’t bringing in as many mobile sales, but desktop sales are in their normal ranges for that site, you know you need a bit of mobile optimization. If you check out the image below, you can compare each of these channels with their overall visits produced, with how many pages the customer visited per session, and their overall conversion rate. Based on this data, we can see the first domain’s most lucrative channel for conversion was paid search, although direct traffic performed the best in terms of visits. This is key in knowing that these paid search ads are working well. You can also see in this same image that for the EU version of this domain, while Social organic brings in almost as much as direct traffic, the conversion rate is abysmal. This means that there is a disconnect between the social networks for this domain and the offer. If you want to compare the same channel across your domains, simply cancel your dimensions and re-add the channel before adding the merchant sites. This will group all of your domains’ data based on the first dimension or channel you choose. Once you change the order of your dimensions, filter the the channel you’d like to see by checking the little slider button next to the channel name. You can switch around any of the dimensions and metrics to get a detailed view of your store’s analytics. From here, you can compare all the features you love in the Analytics Explorer. You can compare two sides of the same coin by selecting dimensions you’d like to examine. There’s no limit to how many you can select and you can change the order by canceling all of the dimensions and reordering them to compare merchant sites by channels. Device: You can check out which devices your customers use the most often to browse and purchase from your site. Visitor Type: With this view, you can get a break down of each of your customer types, whether they are signed up and registered as customers, whether they’re repeat customers, or whether they’re new customers. Average Visit Length: This metric shows you how long a customer spent on your site on average. Visits Before Order: This is a bit different from total visits, this shows the visits from a particular channel before an order was placed. So if a customer goes to the site from Facebook 3 times before an order, the order count for Facebook would be one, but the visits before order would be 3. Order Value: This metric shows you exactly how much customers spend on your site. This is helpful because though one channel might be sending less visits, it might be sending customers who purchase more. Average Order Value: While order value shows you the total value of orders on your site, the average order value shows you how much each customer spends on average. Checkout Abandonment Rate: This metric is straightforward. It shows you how many of your customers abandoned their cart in checkout. Combine this metric with dimensions to get a clear view of your checkout UX. Bounce Rate: This is the amount of people who landed on your site and left before browsing or purchasing from you. 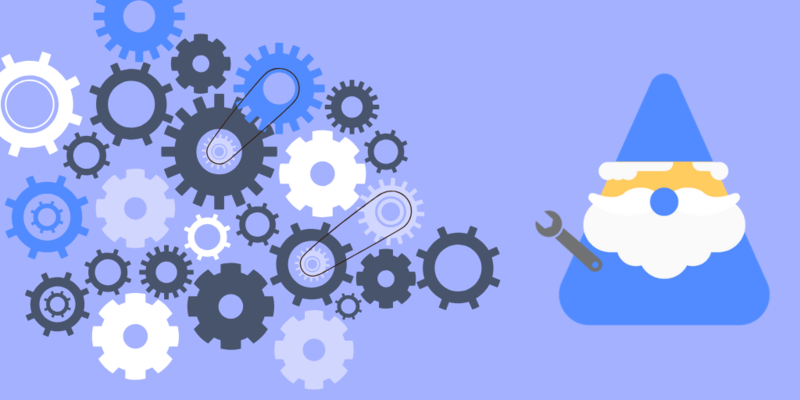 Failed Discovery Rate: Differing from bounce rate or checkout abandonment rate, these are the customers who have left your site in the middle of browsing without interacting with your checkout process. Conversion Rate: This is the number of customers who made it all the way through your sales funnel and purchased from you in a percentage of your total visits. Marketing Cost: Once you connect different marketing channels, you can get a snapshot for how much your total marketing cost is. Customer Acquisition cost: This view details how much you’re spending in marketing to gain a new customer on average. What’s awesome about each of these dimensions and metrics is that you can mix and match them until you get the exact information you want. For example, you can compare the Channel and Channel Group with Order Count, Order Value, and Average Order Value to find out which of your channels gets you the highest order value. While you could always do all these cool comparaisons with Divvit, now you can do it for all of your domains at the same time. You can also plot any of these metrics by clicking the little graph icon next to the data to get a visual breakdown of how that data looks. You can play around with your account or if you haven’t installed Divvit yet (SHAME), you can always try it out in our demo. We want your feedback! What do you think of the new Aggregated View feature?